Compassionate Action for Animals exists to educate the public about farmed animal suffering and to build an animal-friendly community in the Twin Cities region. Compassionate Action for Animals is an inspirational example of the powerful change grassroots organizations can accomplish. Through their many forms of thought-provoking public outreach and education, CAA has opened the hearts and minds of countless individuals to the plight of farmed animals. Our work is focused on talking to people who don’t know about the immense suffering inherent in factory farming. After we’ve raised their awareness, we invite them into community building activities to support their transition into a plant-based diet. Then we nurture their advocacy skills and, through all of these activities, create change for animals. Much of our outreach work is focused on college students and young adults. People are still forming their values at this stage, and we’ve found that this is a receptive audience for our message. However, our goal is to reach everyone in the Twin Cities, as well as to serve communities in greater Minnesota, and we’re developing programs that reach a variety of specific demographic groups. Food giveaways are a mainstay of CAA’s veg outreach efforts. 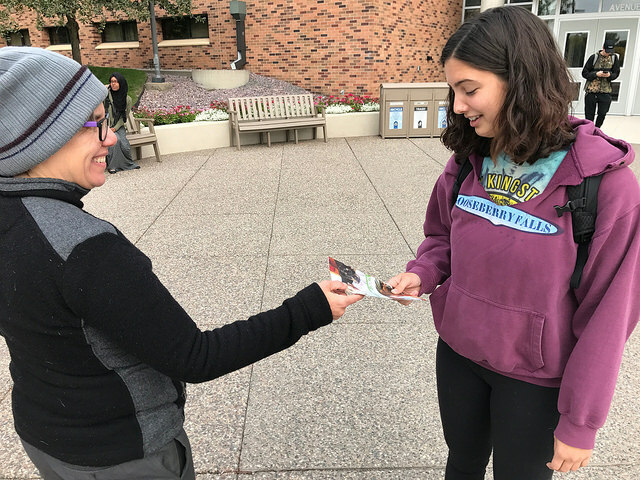 Distributing leaflets about factory farming and veganism is one of the most effective forms of animal activism in terms of time spent, resources used, and results. At pay-per-view events, we offer people one dollar to watch a five-minute excerpt of the documentary What Cody Saw or to use virtual reality equipment to view a simulated experience of a farmed animal. Bridges of Respect is our humane education program that provides free presentations in middle school through college classrooms across the Twin Cities. Our annual magazine highlights the ease, health, and affordability of veg eating, as well as intersectionality between animal and human issues. It also raises awareness of CAA’s programs and a variety of local veg resources. Twin Cities Veg Fest is a yearly event with a little something for everyone including vegan food samples, vegan food vendors, informational booths, and vegan product vendors. Cooking and knowing what to eat are often barriers for people looking to explore animal-friendly diets. It might seem difficult now, but preparing vegan foods doesn’t have to be a chore! Documentaries and movies present unique insights for viewers of the animals’ plight in a way that words and photographs perhaps cannot. Changing what we eat three times a day can be a daunting task. Sticking with the change in a society that devalues animals can be tough too. We provide support in a variety of ways including a mentor program, potlucks, dine-outs, and large vegan events. 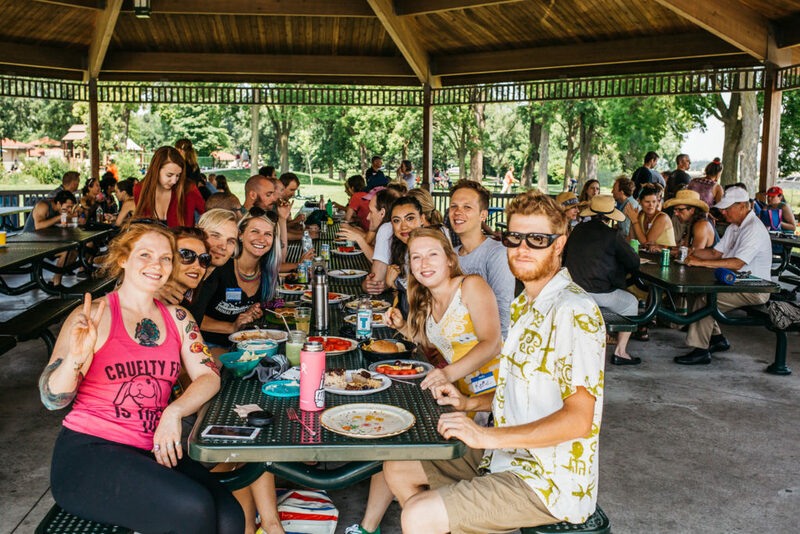 Through these programs individuals discover how healthy, affordable, and tasty vegan food can be; connect with others who can help provide recipes, grocery shopping help, and moral support; and get a warm welcome into the growing plant-based community. CAA regularly organizes dine outs for animal-friendly folks in the community looking to connect and enjoy great food. Potlucks are a great way to build community. 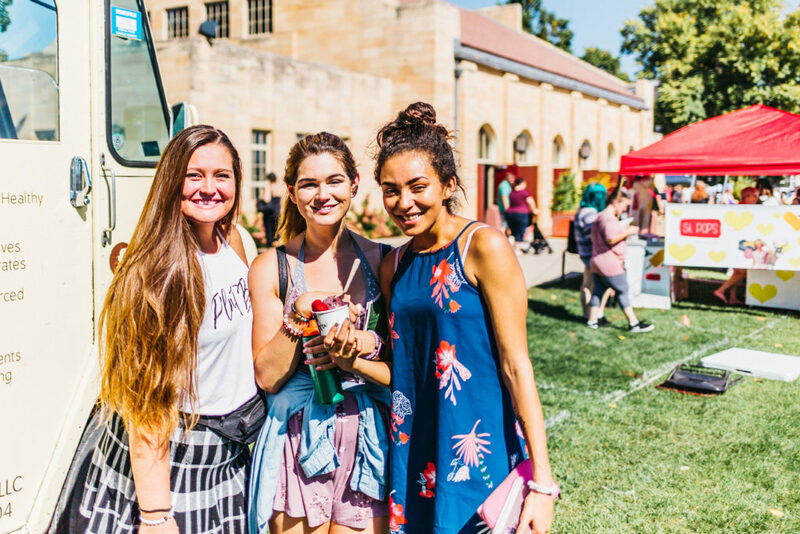 They give attendees a chance to try delicious vegan food, as well as meet other like-minded individuals. Speakers address topics such as how best to speak about veganism and animals issues with the general public, as well as raising awareness about the plight of animals and the connections between animal and human issues. Trainings are provided in effective leafleting and video outreach techniques by our staff. All of the programs above support each other in making the Twin Cities a community that works to end the suffering of farmed animals. The Wholesome Minnesota program works to reduce consumption of animal products in Minnesota institutions such as schools, colleges, workplace cafeterias, places of worship, and restaurants. The program trains volunteers on how to effectively advocate for institutional change. We have a number of useful resources for activists, whether you’re working with CAA, another organization, or on your own.